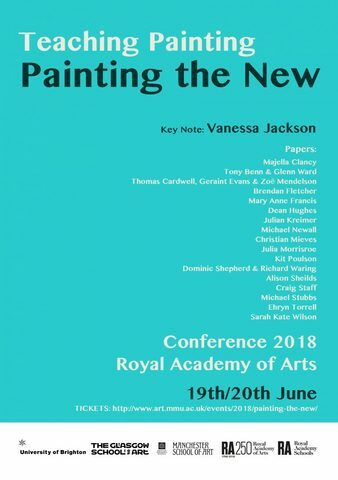 This paper presents an articulation of the activities and research attached to the ongoing research thematic ‘Painting as Technology’, which forms part of the programme of paintingresearch at Wimbledon College of Arts. The value of the research thematic is in its extension outwards from painting into diverse fields via a methodological framework. Incorporating research by staff on the BA Fine Art Painting course as well as invitations to visiting artists and academics, the series offers opportunities for students to connect with these themes in both contextual and practical ways. ￼In this instance the theme emerged via an assumption that painting acts in response to￼the mechanical or digital rather being mechanical - and digital in itself. Painting as a mechanical pursuit engaging the brush/stylus as a prosthetic. ￼Painting as a mode of enhancing the optical and lenticular. In this way, it becomes a form of ￼human extension, driving forms of supra-production or a supra-visual. ￼Painting as a critical envoy from history - its longevity allowing commentary and critical distance ￼on newer media and allowing for their reflection and deflection into supposedly ‘known’ terrain, ￼reimagined. ￼The series launched with a symposium that looked at the concept of techne – the ￼importance of craft practice in art making – as it relates to painting through film, the ￼digital, painting processes and via performative means. This paper examines teaching painting as technology via its own intrinsic engagement with the virtual, the mechanical, the prosthetic and hand-eye relationships.